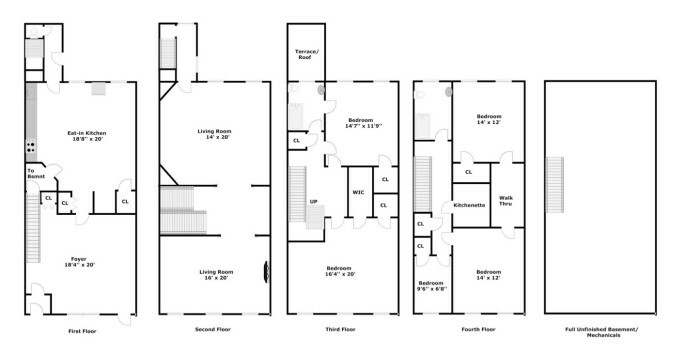 This is the current floor plan. The house is a four-story, two-family Italianate brownstone in the Clinton Hill Historic District, built in the mid 1860s; a major renovation was done sometime around the 1920s which resulted in the original interior staircase being replaced by a rather grand center stair and hall (which we love); somewhere along the way, the stoop was removed (which we don’t); the house also received various upgrades in the ensuing years; the facade was redone several times; one kitchen and two baths and much of its plumbing and electric were updated quite recently, providing modern convenience and making it possible to spend time living in the house while we ponder the daunting task of renovation. 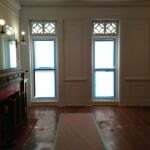 The house has retained many of its lovely details like molding and decorative wood paneling, high ceilings and inlaid wood floors. The gas boiler/radiator heat combo is up-to-date. So we’re not planning a gut renovation, i.e. removing ceilings and walls down to the studs and basically rebuilding the house inside its shell. But that thinking is a bit misleading, as there’s an awful lot of work to be done on practically every inch of it. The general rule for the correct order of renovation is: Pest control (if needed), structural changes and repairs, electrical and plumbing, close up walls and skim coat/plaster, prime, paint, floors. If the house is habitable, there is also the question of whether to do everything at once or slowly over time. 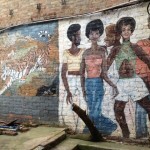 We know there are plenty of individual items we won’t get to do in the first round, but we really want to get the bulk of the big things done in one fell swoop and get on with our lives, rather than exist in a state of perpetual renovation. So our basic list is as follows: Structural updates needed throughout include repairing termite damage in the basement; updating all plumbing and electric; adding a ductless, zoned split air conditioning system; replacing the windows; re-grading and landscaping the backyard; exposing the original brick on the rear extension and some facade fixes including (maybe) replacing the original stoop. 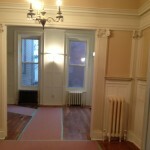 Front room of what will be a separate garden rental apartment; stairs to parlor floor of triplex above. 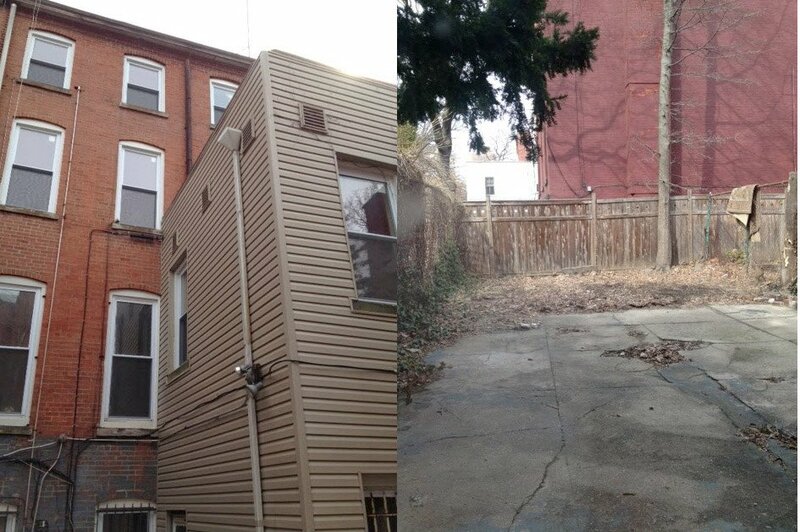 Our goal is to create a garden rental apartment with a separate entry, and a triplex owners’ unit above. 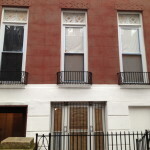 As it was most recently used as a single-family dwelling, the first floor will need to be closed off as a separate unit. 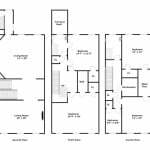 A full bathroom will be added, and the existing kitchen will be moved forward so we can put the bedrooms, with access to the backyard, at the quieter back of the house. The apartment will also have access to the cellar (storage and laundry). 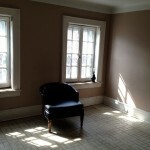 Rear parlor; will be our kitchen and dining room, with doors to deck/stairs/yard. 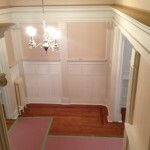 We hope to do this with our kitchen/dining area in the rear parlor. Image © WE Design. 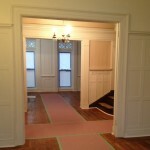 On the parlor floor, we plan to install a new kitchen in the rear parlor, with doors and a deck with stairs to the yard off the adjacent dining area. 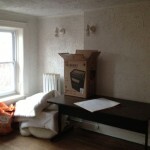 Also on that floor will go a powder room and some storage in the long, narrow rear extension. 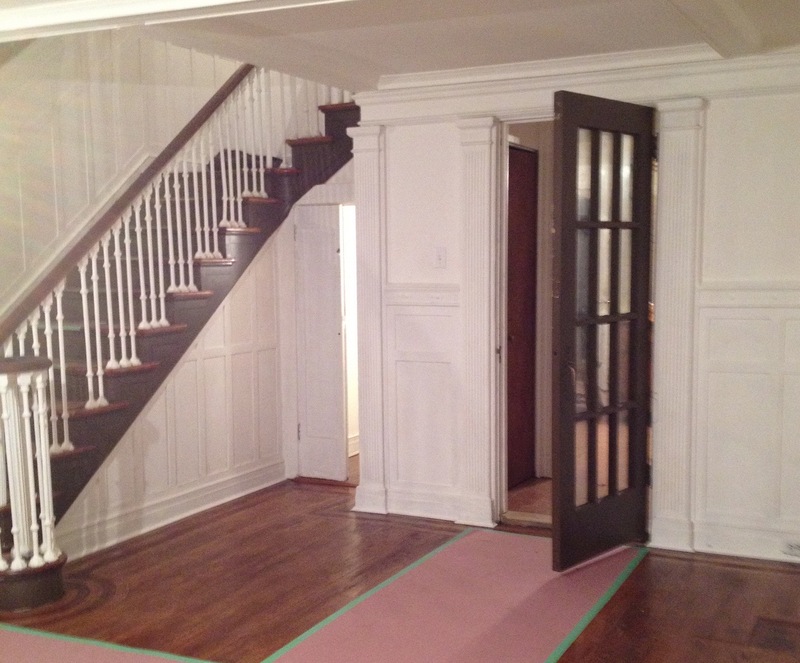 The living room will remain in the front, and front access to the home will be through the center stair hall. One flight up, the only structural change will be expanding the closet in the master bedroom. 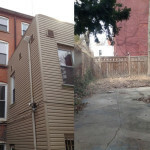 The existing bath will get a cosmetic update and a private upper deck atop the aforementioned two-story rear extension. On the top floor, we may create an “in-law” space within the triplex with a little kitchenette for guests. Updates there will be mostly cosmetic. 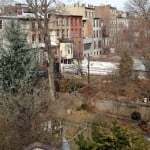 The house is in an historic district, so plans and drawings for all of the above must be submitted to the Landmarks Preservation Commission (LPC); anything done to the exterior is subject to their approval. So there’s a lot to be done. 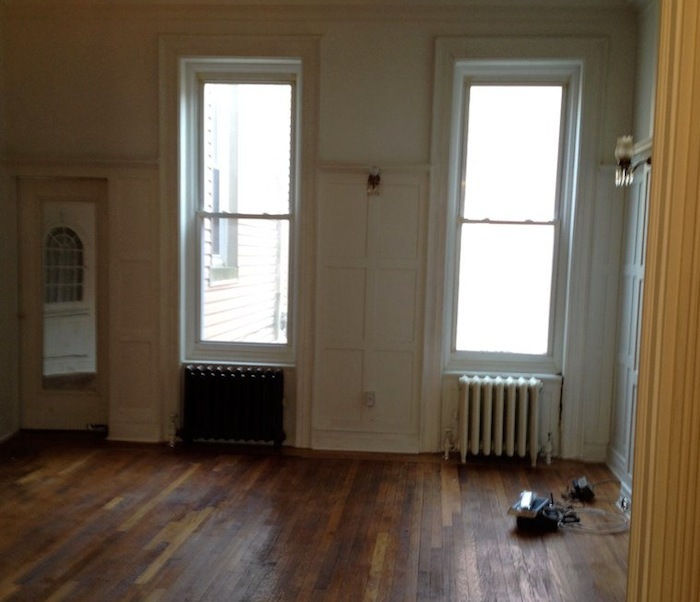 Everyone wants to renovate on a budget. But the reality is that for all but the smallest jobs–especially given the city’s byzantine permitting process–it’s a good idea to abandon fantasies of going DIY and find the right professionals for the job. 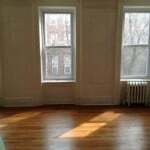 Since I know very little about renovating old houses, I made sure to do plenty of research–the closest thing to your own experience is other people’s experience. Besides talking with tons of friends, colleagues, people on buses, basically anyone who had recently done similar renovations. 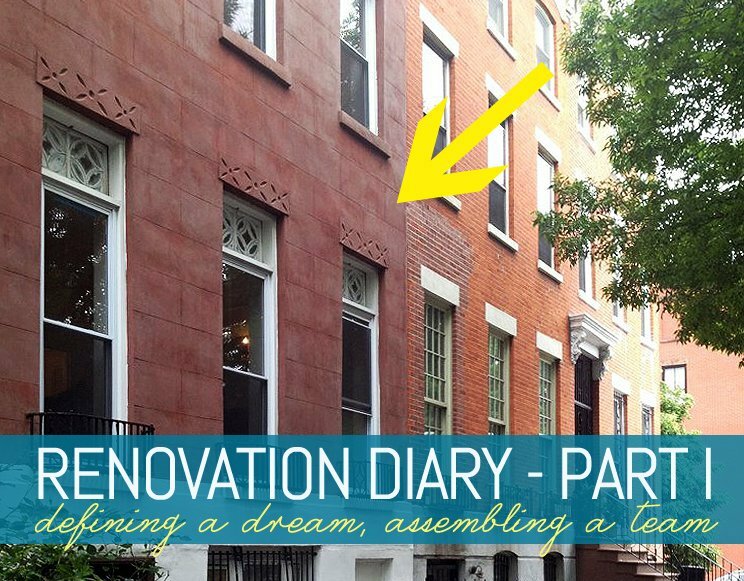 I spent lots of time browsing the Brooklyn real estate and renovation site Brownstoner, read lots of other people’s renovation diaries–and took lots and lots of notes. 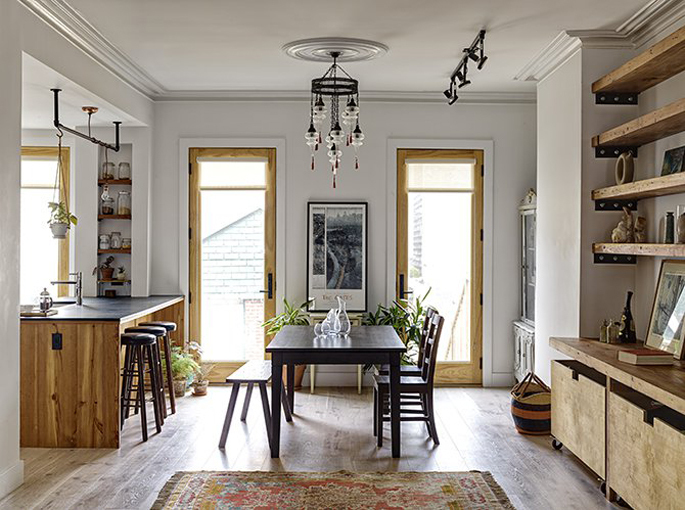 Ideas and inspiration: Remodelista, Brooklyn Modern, Design Brooklyn and Restoring a House in the City: A Guide to Renovating Townhouses, Brownstones, and Row Houses wth Great Style. 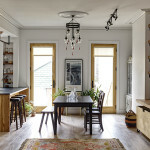 I also spent a lot of time with interior design magazines (Elle Decoration UK and Dwell are faves), books (I highly recommend Remodelista, Brooklyn Modern, Design Brooklyn and Restoring a House in the City: A Guide to Renovating Townhouses, Brownstones, and Row Houses with Great Style) and sites like Pinterest, Remodelista and Houzz. It’s a good idea to collect images of looks you like both online and from magazine and book pages. 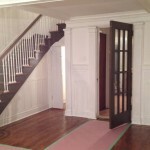 The key professionals involved in any renovation are 1. a general contractor, and 2. an architect. For anyone not familiar, the architect figures out the structural and permit issues, creates drawings of the proposed end result, and submits those drawings to the proper regulatory agencies to obtain approval and permits. The contractor sizes up the job to be done, figures out what will actually be needed in terms of doing the actual work (materials, tradespeople, time) and estimates what it will all cost. The contractor also handles the overall task of getting all the work done, from finding and managing the people who’ll to do it to obtaining the materials needed. There are also: subcontractors (i.e. everyone who actually does the work) and possibly designer(s), engineers, an expediter and a project manager. 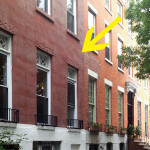 New York City is filled with architects and contractors at a various price and skill levels. But before you ask around and pick one from each column, it’s a good idea to figure out how they’ll work together to keep costs and headaches down as much as possible–and to achieve the vision you’d like as your end result. 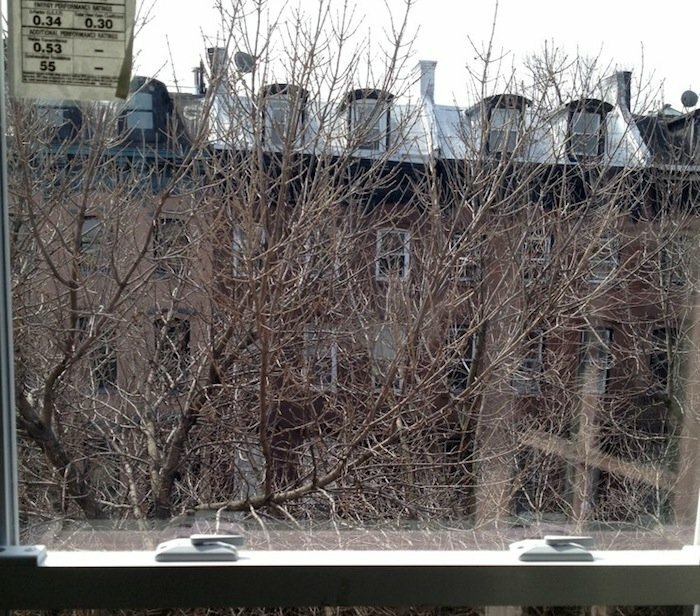 View across the street from the top floor. Architect-led project. This means you hire an architect first. He or she will be the point person on the project, and, to a degree, your advocate on it. The architect will create and submit drawings before a contractor evaluates the job to be done and work begins. Once the architect has submitted drawings and obtained permits, you’ll get bids from contractors to take the lead on the building side. This option does not mean contractors–including any that you bring to the table yourself–don’t have to bid competitively on the job. Many architects are also design professionals who can help with aesthetic and materials choices for interiors as well as infrastructure. Because of this, many architects sell their design services in addition to the job of creating drawings and permit submission. Contractor-led project. In this case you hire a contractor, and an architect is selected by you and the contractor to do the drawings and permit submission. 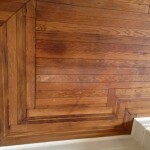 This option means both the architect and the contractor are working on the job from the beginning. Builders often offer this as a “design/build” service. In other words, the builder (contractor) serves as the lead, managing the project, supervising the designs and finishes, obtaining the drawings and permits and the actual day-to-day work. Like architects, contractors often are, or partner with, interior design professionals. A word about “design/build”: It is sometimes mentioned that this is illegal in the state of New York. The law refers to a situation in which an architect and a contractor are business partners in the same company as a “package deal.” This creates a conflict of interest where there is no competition for the work. The design/build firms we’re referring to simply offer expert services that cover both design and construction. A third option is a project manager-led project (Just to complicate things, this may also be offered as a design-build service). These professionals are neither contractors nor architects themselves, but have networks that include both. They’ll manage your project from start to finish, from bringing an architect on board for drawings and permits to getting bids and choosing a contractor to overseeing everything on a day to day basis. This idea is basically the same as hiring a contractor and an architect at the same time, there’s just another layer of management between the property owner and those individuals; the claim is that this keeps costs down because a knowledgeable professional has a stake in managing the budget as a whole, therefore handling any budget issues that arise. In our case, we decided that the first option was the way to go. Having your architect, i.e. the person who has drawn up all the plans for the finished product, be your advocate in the execution of said plans, seemed like a good idea. Another plus for this option is that your architect will have contractors that he or she has worked with before and can recommend for the job; it’s important that these individuals be able to work well together. Again this does not mean contractors don’t have to bid on the job; you–the homeowner–should be encouraged to bring in your own choices if you have any. On the down side, this option may take longer, because the drawings are being submitted before any work begins on the job, though ideally that becomes a good thing because more has already been discussed and decided before the price has been estimated and work begins. Rear of the house; two-story extension and backyard, which we’ll landscape. 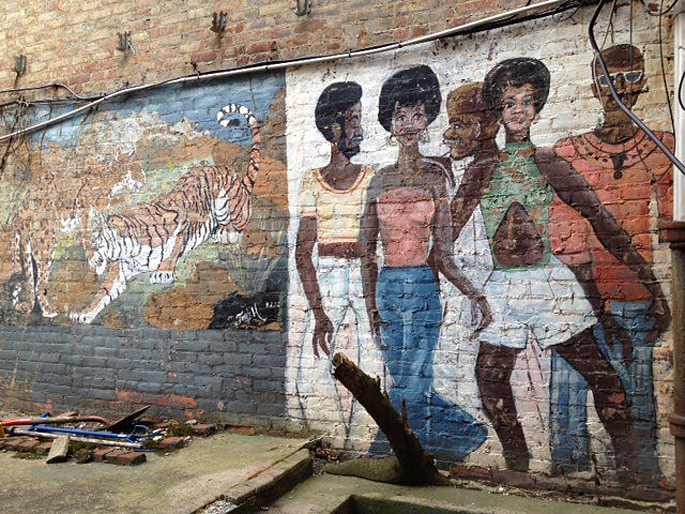 Backyard mural! We’re keeping this. 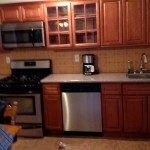 Existing garden level kitchen; recently renovated so it can be used for now. 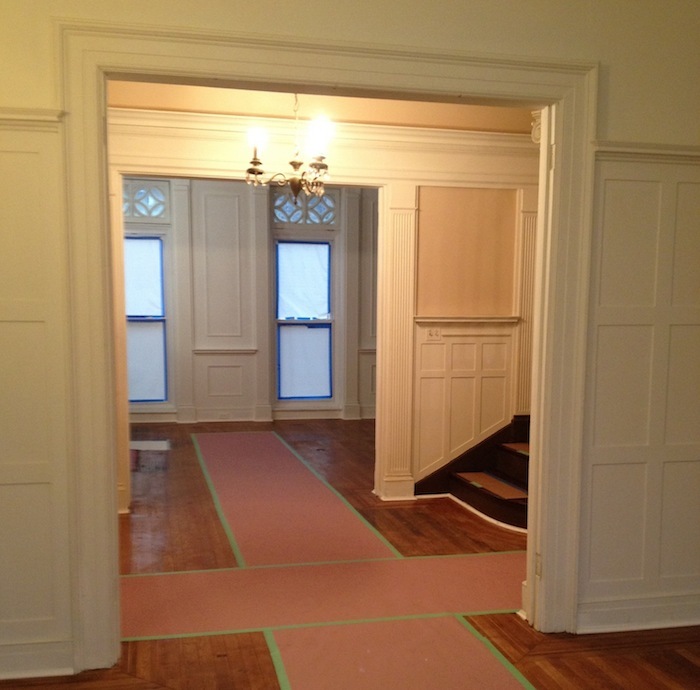 Center stair hall, view toward living room on the parlor floor. 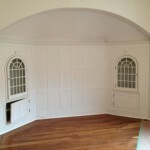 Rear parlor; will be doors to deck, dining room and kitchen. This is where the kitchen will go. 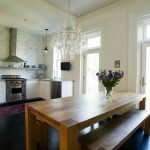 Another inspiration for the kitchen! Image © Ensemble Architecture. 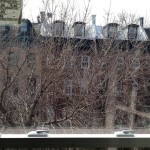 View across the neighborhood’s backyards. We may replace the building’s original stoop.